Just press the button to release the dirt – quickly and hygienically. 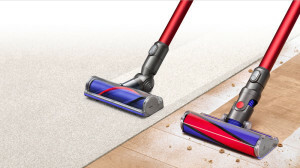 Dyson handstick machines have a trigger grip that releases instantly, so battery power is only used for cleaning. All Dyson handstick vacuums come with a 2 year guarantee – parts and labour. Please see Dyson’s Project Partner Page, or click on the image to head straight to their website to see their impressive range of products!